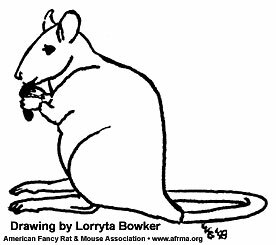 This article is from the Summer II 1998 AFRMA Rat & Mouse Tales news-magazine. QAfter I hold my rat, I notice little scratches/spots on my arms that itch. Is there anything I can use to stop the itching short of not holding my pet? AMany people find that it is simply the tiny pinpricks left behind by their rat’s needle sharp nails that cause this reaction. It can be easily solved by trimming your rat’s nails. If the itching doesn’t stop after a nail trim, chances are it’s caused by an allergic reaction. This is often seen in folks who use cedar or pine bedding. A change in bedding usually helps. If this doesn’t work, it’s likely you are experiencing a reaction to the rat itself. Often this is caused from either urine or saliva on the rat’s feet. Wash the rat’s feet and underside with a damp wash cloth before handling it, and make sure you wash your hands thoroughly immediately afterwards. There have been several things used by different people to help alleviate the itching—rubbing alcohol, Benadryl Itch Stick, and Aloe Veterinary Cream for Animals by Nature’s Choice (it’s soothing, natural, effective, with aloe, vitamin E, and wheat germ oil). QWhat can I use to clean my cages out with each week. I have read about Parvosol. Where would I get it? Is there anything else I can use instead? AParvosol wasn’t available for a while, but we were recently able to get more. They have changed the formula and have taken out the dye, and it is now ready to use rather than being concentrated. It may be available through Omaha Vaccine Supply. We also use Nolvasan (Omaha Vaccine Supply, phone 1-800-367-4444 or KV Vet Supply 1-800-423-8211). It is concentrated so a little goes a long way. Other things we have heard of people using are, Rocal (also available through Omaha Vaccine or KV Vet Supply), medicinal hydrogen peroxide (rinse well), Listerine (yes, the mouthwash, rinse well), rubbing alcohol (rinse well), and a diluted bleach solution (1:10 parts water, you may leave on for 15 minutes, rinse well). QThe other day I saw my rat eating her dropping. How disgusting! Why did she do that? Is there something I should be feeding her? Is there something lacking in her diet? I feed the lab pellets and a couple times a week she gets a piece of carrot or broccoli or some other vegetable or fruit. Please help! ARats (and rabbits) perform coprophagy (eating of droppings. This is a normal and important nutritional or behavioral trait in all rodents that have been specifically studied. Coprophagy serves as maintenance of a normal gut flora by reinoculation of the upper end of the gastrointestinal tract and the capturing of nutrients (especially B vitamins and vitamin K) usually synthesized by microorganisms in the cecum. Even when you feed a well-balanced diet, their digestion system doesn’t allow for the full absorption of nutrients, so the rat eats the droppings to get the nutrients it needs. If your rat is not able to eat its droppings it can become ill. The B-vitamins helps keep the coat growing normally, is vital to the internal organs, and is an appetite stimulant. If your rat needs B-vitamins supplemented, your vet can give your rat a shot, fluids, or oral vitamins. You can use the capsules (use about ¼ of a capsule in 1 cc of baby food). You will have to force feed as it doesn’t taste good. B-complex vitamins are water soluble so what they don’t need are passed out of the body.